Good day my sweet friends. How was your weekend? Mine was pretty okay. Still nursing a bad cold that struck me down last week, but on the whole I was on the mend. And the fact that we had really nice Fall weather really helped. What also was good for body and soul was hanging out with friends over dinner. We had ourselves a little dinner party. So I of course spent most of my time preparing for that, as in throw some food in the oven and then get on with the table setting part of the preparations. I made a Fall table setting. I like to have the table ready and waiting when the guests arrive. It is the first thing they see when they walk in, and what is saying more ‘welcome’ than a fancy table. Besides I think when it comes to dinner parties, first impressions are everything……. Of course within five minutes of sitting down all the extras where carted off the table. The bouquet of leaves was blocking our view and the pumpkins needed to make room for actual food. But that was all right. They had all served their purpose. I had my fun with dressing the table, the guests were pleased with the effort I took, and a good time was had by all. I really loved how this Fall table setting turned out. It was pretty laid back and quick to set up, but the combination of the white china, against the green leaves and pumpkins really worked. I never have a plan when I start doing one of these. I just sort of start and keep going until it feels good. Story of my kind of decorating. I have never ever drawn up a plan or a sketch for any of my decorations. I know some people do, but I have to ‘feel’ my way through these things. The table was pretty, the lasagna tasted good, the company was excellent and the weekend was a success. So what have you been up to, these days? It’s so fresh and pretty and fallish without all the orange and yellow people seem to need. Love this. We had a dinner party last night, too. Our table wasn’t nearly so fancy. Ah, but maybe your food was a lot more fancy than our lasagna! I am not that into yellow and orange, I can only take so much of it, and when and if I use it is only outdoors. But I think this green and white table was Fallish all the same. Thanks for your sweet words! So simple, yet so beautiful. I am decorating for Halloween. The fall décor didn’t get much attention this year because my Mom is very ill. Thanks for sharing the inspiration pics. Sounds like a fun evening! Oh I am so sorry to hear about your mom. Hope she will be feeling better soon. We don’t ‘do’ Halloween over here. So it is Fall and then on to Christmas. Wow!!! You saw the white and green pumpkin, and I love the gourds this year for I noticed at our grocery store some had the long stem too. But I love how you played off the green! And so pretty (I like the silver candle holders). Then your org ish red came from the lasagna! How truly colorful. My aunt told my mom that she and her sisters always started with the table set for when their Papa came in, it then looked like dinner was almost ready!!! I do believe that is true!!! I’m glad you had a fun weekend! Thank you, sweet Gwen, and yes I think your aunt was so right. A table that is already set, not only tells you that dinner will be on soon, but in my book, also that dinner must be good if the table is looking that nice. We don’t see many gourds here and the buckload of pumpkins here is quite recent too. We are copying you guys all over, I guess in a couple of years we will be decorating for Halloween too (totally not a holiday here yet). Thank you! I was kind of pleasantly surprised with the outcome myself. 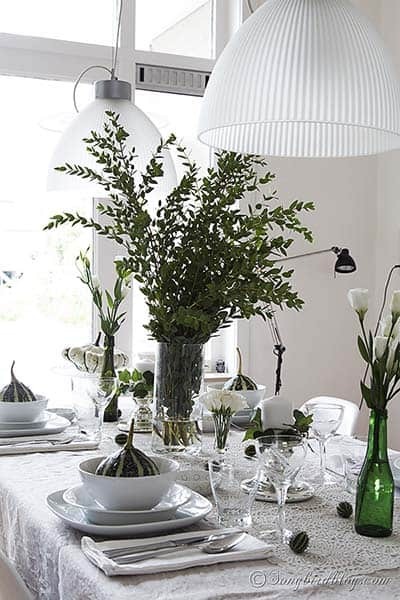 Love the combo of white and green! I did the same thing myself (link below). 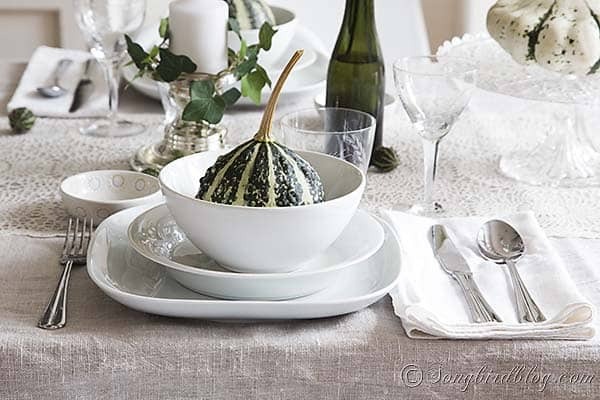 🙂 I love your gourds… and don’t you love how white dishes go with anything?